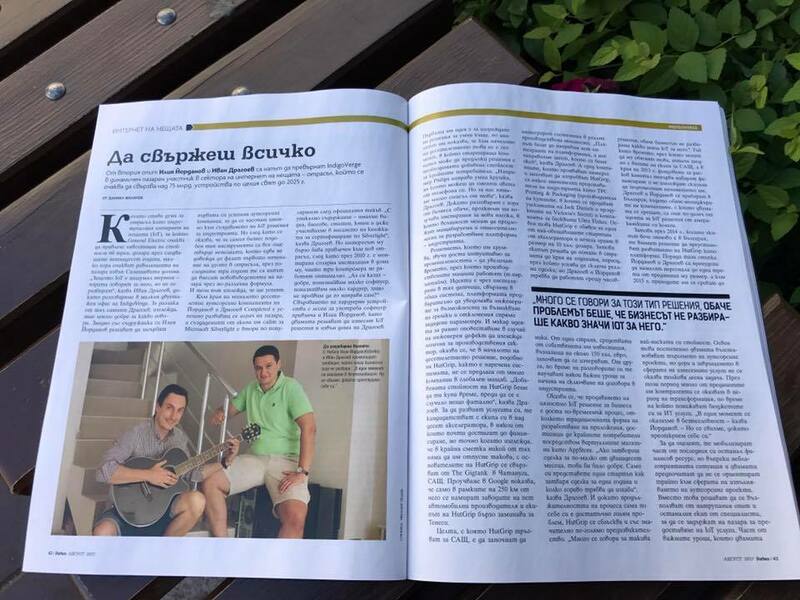 In the article titled ‘Connecting everything’ the magazine contributor Daniel Vassilev tells how our CEOs Ilia Iordanov and Ivan Dragoev are paving the path to making IndigoVerge an important player on the market of Internet of Things. For those unable to get a copy of the magazine – we post a short summary of the key article highlights. How IndigoVerge CEOs Ilia Iordanov and Ivan Dragoev got the idea to head to creating IoT solutions for the manufacturing industry? How did they found the company IndigoVerge and how it evolved? How their experience in the sphere of outsourcing turned out crucial on the way to IoT? How the company’s proprietary platform HutGrip was born way ahead of its time, but the experience gained while it was being built in the USA turned out invaluable years later, for customer projects based both in Europe and the USA? How big is the challenge of promoting an innovation, whose value the market is not yet mature enough to understand? The answers to all these questions can be found in the article by Daniel Vassilev in the latest edition of the Bulgarian ‘Forbes’ magazine. In the discussion with the article author, IndigoVerge CEOs also presented their new business philosophy – the switch from focusing on a specific technology to delivering a complete business solution – from ideation to marketing it. ‘We now focus on the problems we need to solve for our client’s business. And then we pick the technologies based on which the specific solution will be built.’ – says IndigoVerge CEO Ilia Iordanov. Ivan Dragoev tells about the project IndigoVerge has recently worked on, along with one of the biggest importers of electronic components in Bulgaria – Comet Electronics – Smart street LED-based lighting. The project has been successfully released as a pilot in Sapareva banya municipality, with upcoming releases in two more residential areas in Bulgaria. Within less than 2 years IndigoVerge became experienced in a broad range of IoT-based solutions and has already become a trusted partner for many industrial customers in the USA, some of which got familiar with the company thanks to its platform HutGrip. ’This is a really good example of how we introduced to the USA a business solution that was truly innovative, but the business needed 3-4 years to figure out the benefits and the value of what we built and proposed back then.’ – says Ivan Dragoev. The two CEOs expect that the income of the company would increase by 50% by the end of the year, compared to 2016. And over the last two years, the staff has almost doubled. Their optimism is also based on the scale of the businesses IndigoVerge is working with – among them enterprise companies from the telecom sector for example. Interested in finding out more? Considering adopting IoT to increase efficiency for your business? Contact us.